For both I took consolidated statement. 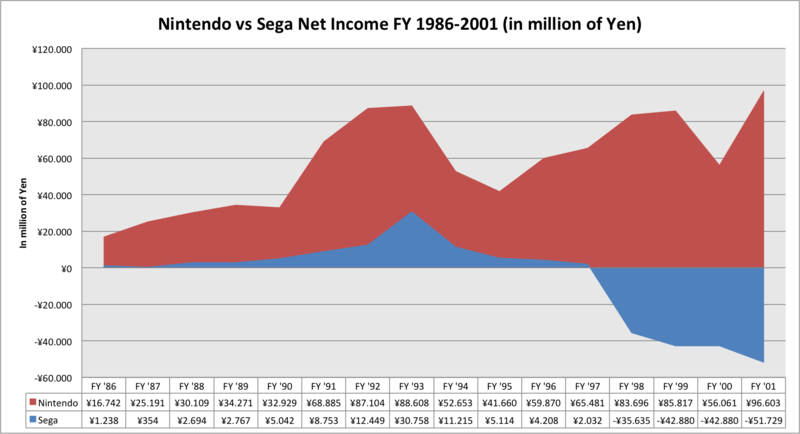 The previous graph on the same subject I did had non-consolidated data for Sega. So, I found this thread (it's french) and they're talking about two books by Florent Gorges and he lists the following yearly sales numbers in his books (for Master System & NES). They also mention that he uses GfK numbers?, but some also mention that his numbers are not that correct? It's french, I can only assume because of Google Translate gibberish. de monde, je croyais le match très équilibré, la NES a fait le double de la Master (presque 2 millions contre un peu moins de 1 million) sur la période 88-93." Squaresoft shipment data for FY 2002. The first image is of special interest because software shipment for WonderSwan software is a rare sight. SNK status during the first half of NEO GEO era (1991-1995, with 1996 being a projection). Shipments of games created by Quintet (via Internet Archive). Enix published most of their games back then. They died for our sins. NoA: "Illusion of Gaia sold best in the US! So how about we don't release the sequel in America?" I recall IoG being heavily marketed in North America. Maybe the ROI wasn't great after factoring marketing costs. 300K is probably small potatoes especially when you consider other stuff Nintendo was publishing in 1994 like DKC. IoG was localized by the US Enix which closed its doors before Terranigma arrived. Nintendo of Europe localized the games themselves and had an ongoing contract with Enix for localizing three games which were Soul Blazer (1994), Illusion of Time (1995) and Terranigma (1996). Nintendo of America published Illusion of Gaia in the US. I'm sure they could have easily localized and published Terranigma if they wanted to. I don't know, those are big numbers for something not a major Nintendo franchise title. I'm really enjoying this thread, a lot of interesting infos. There is NPD numbers for Saturn software sales floating around the net? I saw PS1 and N64 and I'd love to see data for Saturn games. I think we can probably leave it in the ballpark of 83.000 units for 1990, because I don't know if we're going to get any better reports than this and ChartTrack/ELSPA seems to have used the same data for really old estimates. Crazy how strong the MegaDrive/Genesis was compared to the SNES. There's also some pre-1991 data for 8-bit systems by Electronic Arts (and some after 1993), numbers differ from MMC/ELSPA. Mega Drive seems too high, SNES probably about right, still EA's 16-bit estimates are 1 million higher than Chart-Track's. NES probably a bit high, SMS looks about right. Playstation too low, Saturn close enough. Sony (Japan), consumer electronics concern, says that its PlayStation 32-bit video games system has sold 50k units in five weeks, making it the quickest-selling system in the UK. Meanwhile, Sega (Japan), games specialist, says that its Saturn 32-bit games system has sold 50k units wholesale since it was launched in the UK in summer 1995. Sony aims to sell 2 mil PlayStation units in Japan by end-1995. Sony also says it has sold 300k PlayStations in N America and 200k in Europe since early-autumn 1995. Sega claims to have sold 1.5 mil Saturns in Japan and 100k units in Europe. Article discusses PlayStation and Saturn in further detail. Sony and Sega are claiming that the PlayStation and Saturn sold 200k units in the UK in 1995. According to Sony, the PlayStation had 130k unit sales at sell-through, with around 35k units being sold in December 1995. According to Sega, the Saturn sold 25k units in December 1995, and its UK installed base is around 80k machines. Sony emphasises that its 130k units figure is correct, but places Saturn sales at around 50k units in the UK. Sega still using shipped, Sony's figures fit the Chart-Track chart fairly well. Sega has claimed leadership of the games market in the UK, despite Gallup figures which place the Saturn slightly behind the PlayStation, and has accused Sony of using copycat retail tactics. Sega claims that at the time of the Gallup survey, it was 38 machines behind the PlayStation, but has now reversed the situation. Sony has dismissed the comments, claiming that total sales of the PlayStation have reached 156k, with Saturn sell-through running at 57,500 units. Sony has challenged Sega to agree to an audit of Sega's Saturn and Sony's PlayStation video games machines sales since 1995, when the machines were launched. The challenge follows Sega's recent claims that it is leading the 32-bit market in the UK. According to Sony, the audit would show that PlayStation sales are substantially higher than those of the Saturn. Overall PlayStation sales in the UK are said to be 160k units. Sony's 'best estimate' for Saturn sales are 60k units. Sony has offered to pay 50% of the GBP6k cost for the audit. Sega has refused Sony's challenge. Sony has announced that it missed out on sales of 100k of its PlayStation games consoles in Europe, of which 50k unit sales were lost in Germany, 20k unit sales were lost in France, and 30k unit sales were lost across other territories in Europe. Lack of stock was the reason for Sony missing out on the sales. However, as at 01 January 1997, Sony had an installed base of 700k PlayStations in the UK, 515k units in France, 345k units in Germany, 100k units in Scandinavia, 97k units in Spain, 85k units in Italy and 80k units in Benelux. Total installed base for Australasia and Europe totalled 2.2 mil as at 01 January 1997, of which just under 2.1 mil units were in Europe. Sega Europe has criticised suggestions that the fight for leadership in the European console market is becoming a race solely between Sony and Nintendo. According to Sega, the Saturn is still the most credible alternative to the Sony PlayStation, and will have sales higher than those of the Nintendo 64 in 1997. 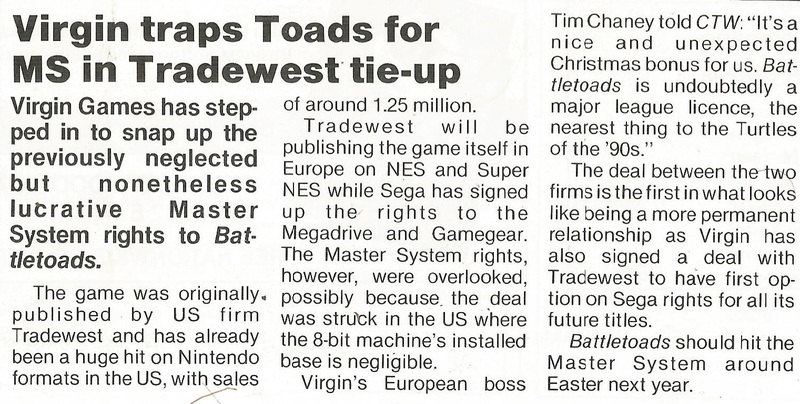 Sega had a 900k units installed base of Saturns at end-FY to 28 February 1997, of which around 400k were in the UK. The Saturn is forecast to have 1 mil higher unit sales in Europe in 1997, of which 400k-500k will be in the UK, according to Sega. THE Games (UK), distributor of the Nintendo 64, is said to believe that a target of about 400k unit sales of the Nintendo 64 by January 1998 is achievable. They probably never shipped any more Saturns to the UK. World: Total advanced games console sales in the US, excluding MPCs, rose to 11.06 mil units in 1997, vs 4.7 mil units in 1996, with the Sony PlayStation accounting for 6.3 mil units, vs 2.3 mil units, the Nintendo 64 (N64) for 4.7 mil units, vs 1.5 mil units, and the Sega Saturn for 60k units, 900k units, according to Screen Digest magazine. Total sales in Japan reached 7.4 mil units in 1997, vs 6.5 mil units in 1996, divided into 4 mil PlayStation consoles, vs 2.9 mil units, 2 mil N64 consoles, vs 1.7 mil units, and 1.4 mil Saturn consoles, vs 1.9 mil units. Total sales in W Europe reached 7.32 mil units, vs 2.21 mil units, divided into 4.42 mil Playstation consoles, vs 1.63 mil units, 2.64 mil N64s, vs 23,400 units, and 256k Saturn consoles, vs 557k units. 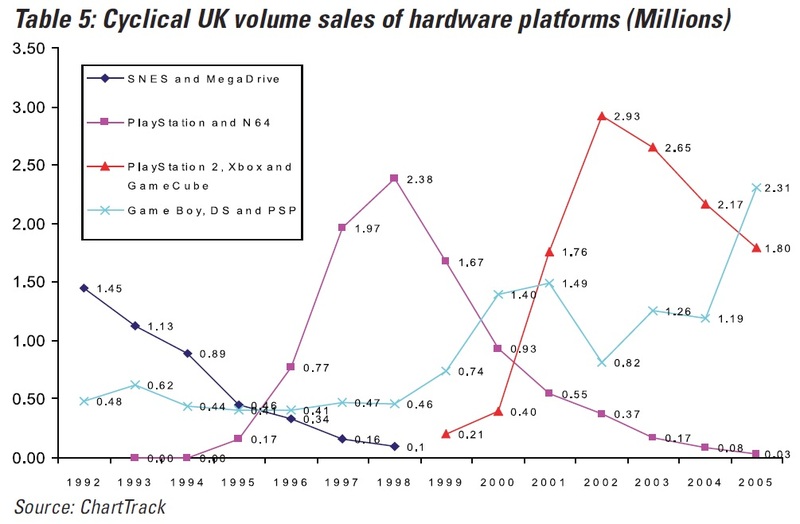 Sales in the UK reached 2 mil units in 1997, vs 770k units in 1996, divided into 1.23 mil PlayStation consoles, vs 575k units, 640k N64s and 130k Saturn consoles, vs 195k units. Sales in Germany reached 1.63 mil units, vs 330k units, made up of 837k PlayStation consoles, vs 275k units, 780k N64s and 15k Saturn consoles, vs 55k units in 1996. Data in source is displayed in table form and lists data for other countries. Screen Digest worked with ELSPA on their reports, their UK figures should be Chart-Track. The 1996 and 1997 numbers here fit well with the Chart-Track chart. Sony and Nintendo sold over 300k hardware units between them in the period 12-26 December 1998, with Christmas 1998 proving to be the most successful ever for the games market in the UK. Sony sold 250k PlayStation consoles in the period 12-26 December 1998, for total UK sales of 1.8 mil units in 1998. The firm estimates a total UK installed base of 3.75 mil PlayStations and expects this to reach four mil units by end-March 1999. THE (UK), Nintendo distributor, sold over 80k N64 consoles between 12-26 December 1998, vs over 100k units in the year-earlier period, for total 1998 UK sales of 600k units. Nintendo now has a UK installed base of 1.2 mil N64 consoles. Seems to be sell though, pretty close to Chart-Track chart. 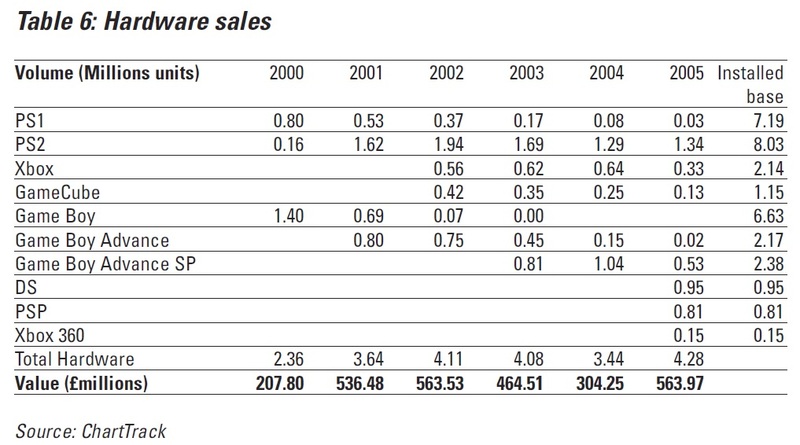 Dreamcast sold 10.000 units in 2002, the LTD is 600.000 (from a PDF which included all sales for Europe / GfK via Screen Digest). Nice find! Do you have a link or a copy of that pdf? That seems to confirm 400k for Saturn. Such a bomb compared to Mega Drive, but UK still made up 40% of EU sales, which goes to show just how poorly it did in the rest of Europe. Here's an extract of that report. Yeah, this should be right. ELSPA '05 SG+SNES		?	? 1.450	1.130	0.890	0.460	0.340	0.160	0.100		? MMC Report Genesis		? 0.196	0.997	0.674	?	? ?	? ?		? MMC Report Total		? 0.196	1.447	1.125	?	? ?	? ?		? 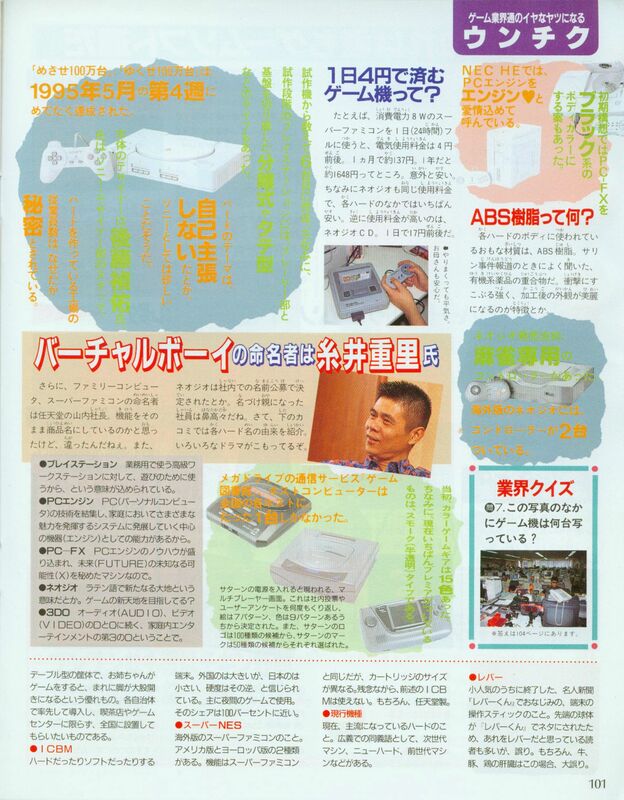 Magazine Scans SNES		-	-	?	? ?	? ?	? ?		? Magazine Scans Total		0.060	0.255	?	? ?	? ?	? ?		? ELSPA data and MMC report have the highest reliability, we should take these numbers as a taken, after that the Screen Digest data, they worked together with GfK, but numbers are old and revised, maybe we find some newer report. 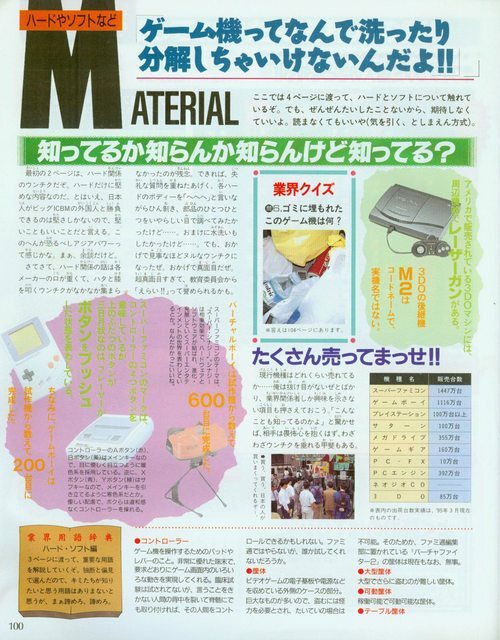 Regarding the Mega Drive in 1990 and 1991, Screen Digest tells us that the MD had an installed base of 250.000 in 1991, minus MMC that's around 54.000 for 1990, this matches one of the magazine scans 60.000 units (but the 1991 numbers from the magazines are off). 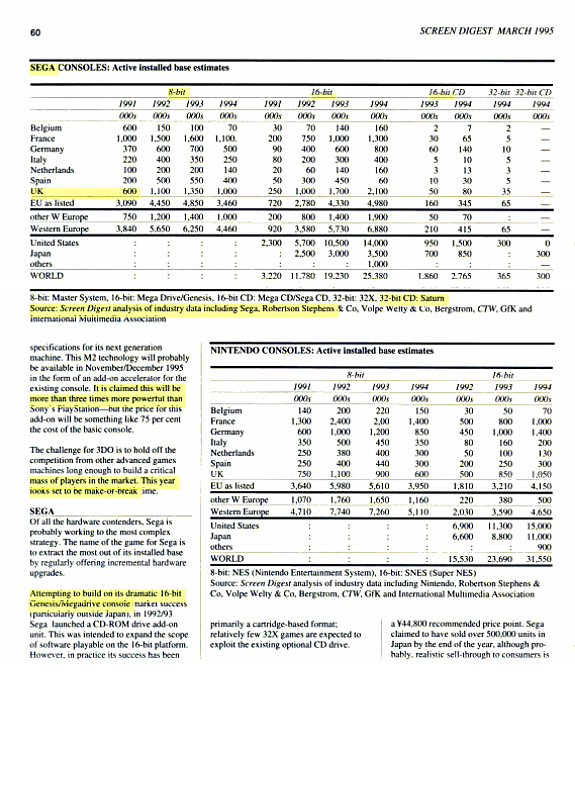 Therefore, I think we can agree to the ballpark of 50.000 - 60.000 units for the Genesis in 1990 and maybe 190.000 - 210.000 units for 1991 (but the 0.196 from MMC should be right anyway). EA Internal is way off most times. Some Asian LTD sales (this data is from Famitsus old business site, you can't see it anymore, they posted these asian numbers alongside with proven USA/Germany/France numbers). Thanks to Benjamin Stevens kindness we now have the Famitsu article with shipment data for FY '96 (source: Famitsu Magazine Issue # 392, Page 8). This is a very important article since we now have close to definitive totals for systems like Game Gear, Mega CD and 3DO (at least for the Panasonic and Sanyo models). It also shows the official standing between SNES and Mega Drive until March 1996 (when Sega discontinued most of its systems in Japan but the Saturn). Very nice! This fills some gaps. Is this where the famous 770.000 number for the Virtual Boy comes from? I remember Aqua saying that the number is probably wrong (in an old thread), but it seems like she mixed up a few things, because her Lifetime Japan number matches the lifetime International number from Famitsu, NPD is also realistic if international sales are 630.000 units. Internally, the Virtual Boy was a failure that Nintendo doesn't like to recognize. As a result, they didn't give me any information it. However, I do have some data on the console. That "770,000 shipments" figure you often see thrown around is wildly inaccurate. It's another example of that esoteric, vague data I was talking about. I have some figures that I believe are much more accurate to the truth. However, these didn't come directly from Nintendo Co. Ltd.,'s internal archives, so I can't guarantee their accuracy. I can vouch that the 496K is the actual number NPD has in its archives for Virtual Boy LTD sales. To note that Sega discontinued Mega CD and Game Gear in FY '96 so those figures can be considered final. I still think Aqua number is correct and the final LTD.
IMO Nintendo dumped all their stock after March '96, Dreamcast-style. However, these didn't come directly from Nintendo Co. Ltd.,'s internal archives, so I can't guarantee their accuracy. Wait, I think I skipped that part when she posted that beautiful thread. Mmmh, now I'm not so sure anymore. 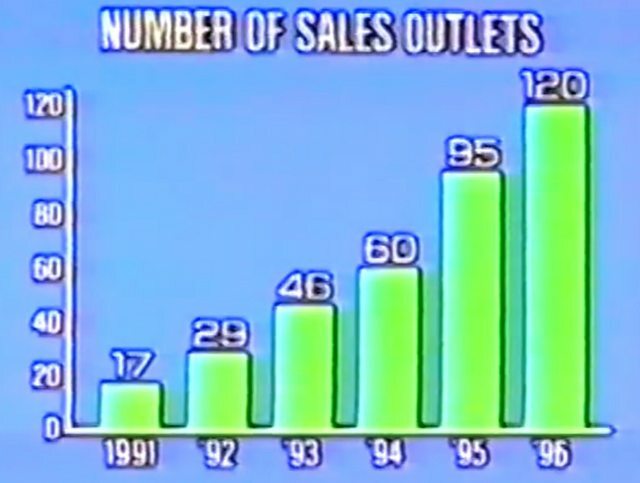 Some numbers from http://www.pong-story.com for the Magnavox Odyssey, the article is written by "Ralph Baer's associate and video game historian David Winter". He probably collected as much documents as he could, so this should be a good source. &#8226; Odyssey was first announced to the public in May 1972. Although a couple pre-production units were distributed in May for demonstration purposes, the production started in August. Nationwide advertising of this system on television and radio resulted in a real success: over 130,000 Odyssey and over 20,000 rifle packs were made in 1972. &#8226; Another 200,000+ Odyssey and 50,000+ rifle packs sold between 1973 and 1975, bringing the total to 330,000+ Odyssey and 80,000+ rifle packs sold. The system was removed from the stores in late 1975 and replaced by two new, simpler models: the Odyssey 100 and Odyssey 200. &#8226; Don't forget that almost 340,000+ Odyssey units were manufactured between 1972 and 1975. Only 130,000 were really made in 1972 (model 1TL200BLAK, RUN 1). More were made later in 1973 (model 1TL200BLAK, RUN 2). Specimens manufactured until early december 1972 have pink screens on the user manual. Those made until the end of december 1972 can either have pink or red screens. &#8226; The very first export of the Magnavox Odyssey was made in Mexico around October 1972 following a very successfull market survey a few months before. It consisted of a US Odyssey with the top of the box relabeled with a very nice Magnavox logo and large Odisea words. The States game was replaced by the Volleyball add-on (a yellow sticker was even put on the side of the box). All paperwork was made in Mexico and printed in spanish. Less than 4,000 Odissea units were produced. &#8226; In Germany, Odyssey was exported in two versions. It was first announced in late 1973 as being sold by ITT Schaub-Lorenz. Very few ITT units were made. [...] ITT still sold this version in 1974 and that about 10,000 Magnavox units were exported to Germany in 1974 and 1975. Click here to view both versions of the German Odyssee manuals. With Germany and Mexico we have around 344.000+ units according to David Winter. I'm eager to see someone tackle MD/Genesis hardware. The wikipedia figure that keeps getting pushed seems sort of dubious. The more "up to date" figure that I consider official is 30.75M (source: CESA White Paper). My guess is that s LTD through March '96 because that's when Sega discontinued MD worldwide. 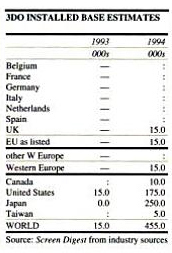 After reading the official Mega Drive total shipment as March '96, I think that Mega Drive LTD reported in the CESA White Paper report (30.75m) is until March '98 (when Sega finally discontinued the system outside Japan). That means Sega has shipped 2.21m after March '96 and since in FY '96 MD shipped just 1.98m and sales were surely declining I think it's likely it took them two fiscal year to ship that amount. 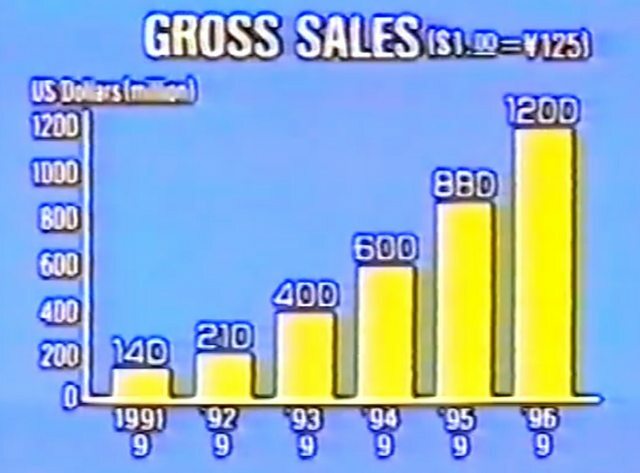 Mega Drive sales between FY'97 and FY'98: <- Educated guess on my part. Awesome, thanks Celine & Benjamin! 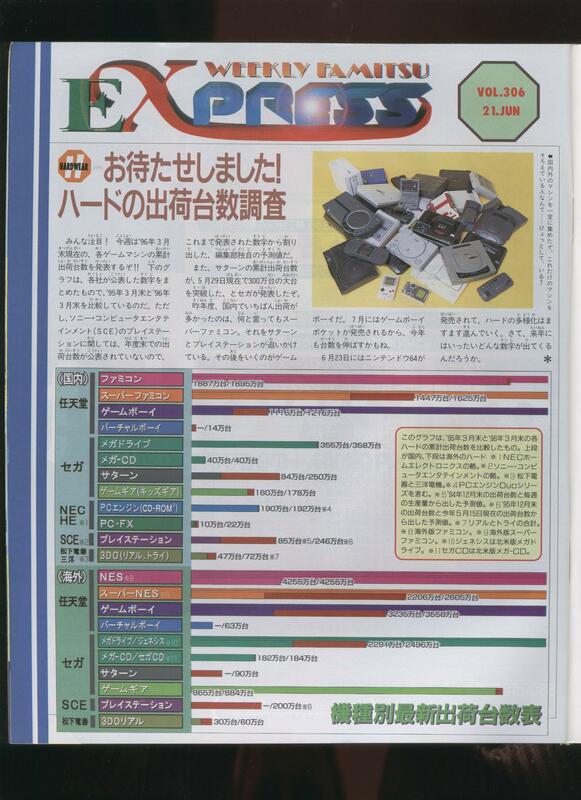 3DO probably isn't the final number, according to Edge the following year's Famitsu report gave a LTD of 750k. The Edge article was from their Japan section, so omitted international shipments. This newsgroup post however does note domestic and international shipments from that Famitsu issue, although only mentions current gen consoles. Perhaps the original article contains 16-bit international shipments too. Saturn units have been shipped. is apparently the result of the huge success of Pocket Monster. 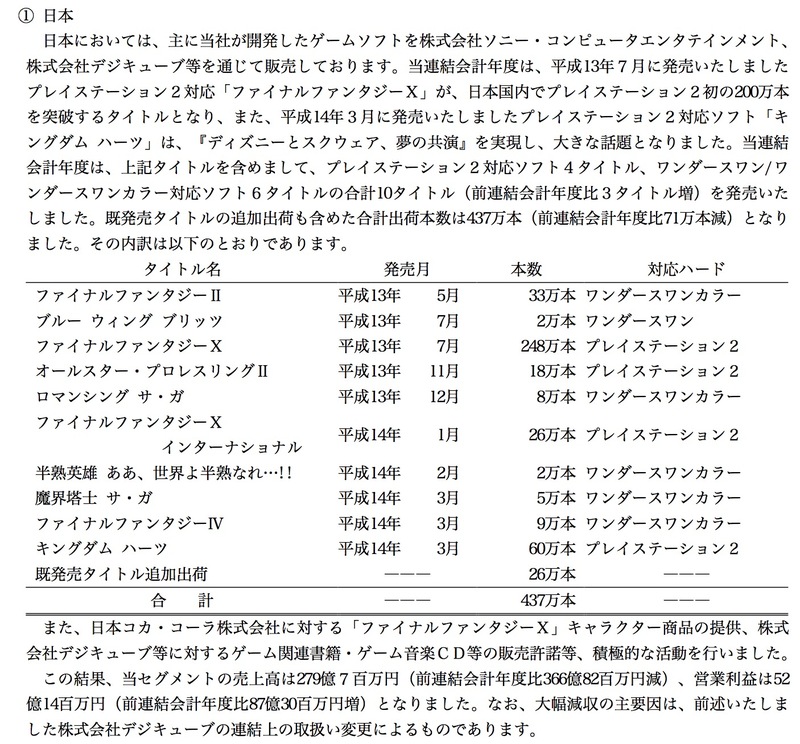 Famitsu's own research. It is not the sell-through amount. Going by the date it should probably be in this issue (Famitsu cover date is 2 weeks from published date). It's a shame that they stopped giving a regional breakdown of international shipments, but at least we know that Asian shipments should be included. If we find the reports before and after the gave a regional breakdown then it should be possible to deduce whether Asian Mega Drive shipments were included with Europe or not. No SMS figures but Mega/Sega CD shipments are very welcome, I have seen some ludicrous figures banded about for that before. However, he commonly used Game Gear figure of 11 million does turn out to be accurate. It should be noted that Majesco aquired the US rights and re-released the Game Gear in February 2001, even releasing a previously unreleased game for it. No breakdown on PC Engine Duo / CD-ROM2 LTD, expected, but maybe it's broken down in a previous report after CDROM2 discontinuation. The 20k for 95/96 were certainly all Duos at any rate. Nice to get the VB breakdown too. The report concludes with a study conducted by GfK, in which video games were voted as the most desired toy among kids. I'm a bit confused, are these just for Belgium? Seems a bit high for 6 months in 1993, or are these LTDs? The numbers are so exact, GfK numbers? finally retired the console in Europe - exactly one decade after its launch. 1992 		235.000			304.000			  500.000			   ??? 1993 		181.000			 83.000			  100.000			   ??? Maybe Sega Frances numbers are shipped but that doesn't explain why 1993 Florent Gorges is higher than Sega France. 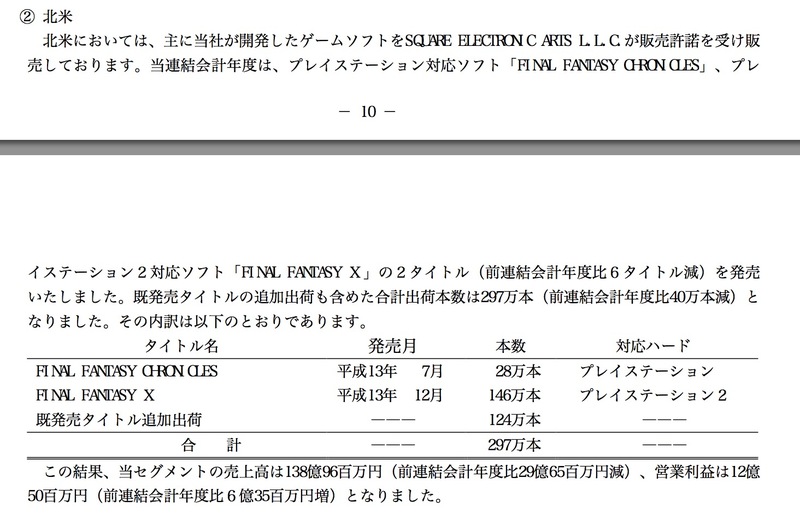 3DO probably isn't the final number, according to Edge the following year's Famitsu report gave a LTD of 750k. The Edge article was from their Japan section, so omitted international shipments. Yeah, that's why I said "close to definitive"
Indeed 3DO was discontinued in 1996 so a small shipment was probably dispatched in FY '97. Ah ah ah must be because Sony counted asian sales instead of Japan-only. That's what I originally thought, but the numbers perfectly match PS1 production shipments*, so they are actual official numbers including Asia. PS1 had only been on sale in Asia since December 1996 however. *Figures for Japan include shipments to Asian countries and regions including South Korea. I have NPD data for all PS1, DC and N64 software up to 2003 (from back when the entire spreadsheet would leak here), which might as well be LTD for these consoles...but I'm guessing I'm not allowed to post it here. Interesting tidbit: The N64 had 23 million sellers. The PS1... 69. Probably more if a few games kept on selling past 2003. Oh and the DC? One. That is super interesting about the million-sellers. Woop! Missed this thread. Subscribed! And after that Majesco went on to sell about 2 million Genesis 3's, though those would not count in Sega of Japan's 30.75 million number of course. Any reliable source that attest Majesco shipped 2 million Genesis 3? I don't think so, but I have seen something saying they predicted 1.5 million sales, and something else saying that sales beat expectations. The two million number is an estimate. But unfortunately http://www.sega-16.com/forum/showthread.php?9132-Genesis-real-sale-numbers&p=312769&viewfull=1#post312769 these links are now dead. Maybe the sources could still be found, though; are some linked in Wikipedia now? But by reading the thread, the 1.5 million number is apparently what Majesco expected to sell. 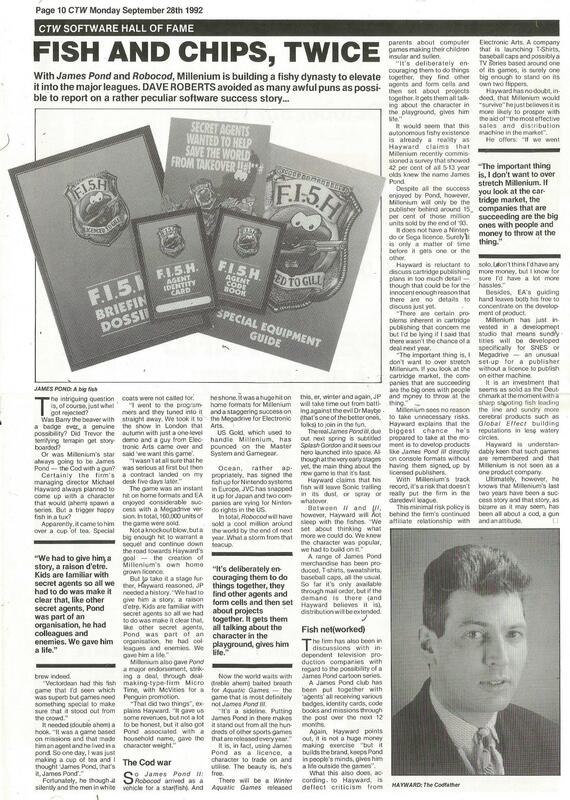 Sam Pettus's SegaBase articles say "between 1 and 2 million" Genesis 3 systems sold, also, if that's worth anything, versus 1 million for the SNES that year (according to Pettus). I've seen 2 and 3 million mentioned as estimates for TecToy MD sales; this varies in part because they've kept selling Genesis and Master System clones, albeit past the early '00s usually ones that don't play cartridges. And on that note, is it worth something that a bunch of modern Genesis clones, both the TecToy and AtGames ones, are licensed by Sega and have built-in Genesis games, while no Nintendo clones are licensed? I see what they've done now. Sony never gave March 31 1995 figures, and presumably never gave March 31 1996 figures by the time the above report was written. They gave calender year sales and May 15 1996 milestone update, upon which Famitsu calculated per day sales and used that as an estimate for March 31st sales. This is noted in points 5 and 6 in the scan. They probably included the same note in the 96/97 report for 95/96 data which was also included in that report. Yeah, I did a quick search and could not find anything acceptable. Same for the fabled 1 million for the Nomad. The idea a handheld by Sega which lasted 5 months before being discontinued and was distributed only in North America could ship 1 million is unbelievable to me. No, I would not put those two numbers into the same category. An article saying that Majesco expected to sell 1.5 million, then the suggestion that it sold better than estimates, is different from that 1 million number because at least there might be multiple sources for the Majesco number, and none are as obviously wrong as the source for the Nomad number is. 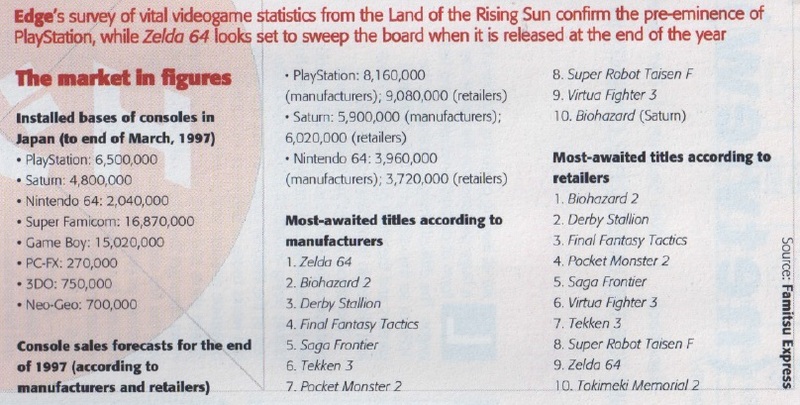 I mean, the ONLY source for that "1 million Nomads" number is that awful "top 10 worst selling consoles list" article from, who was it, gamepro or something? 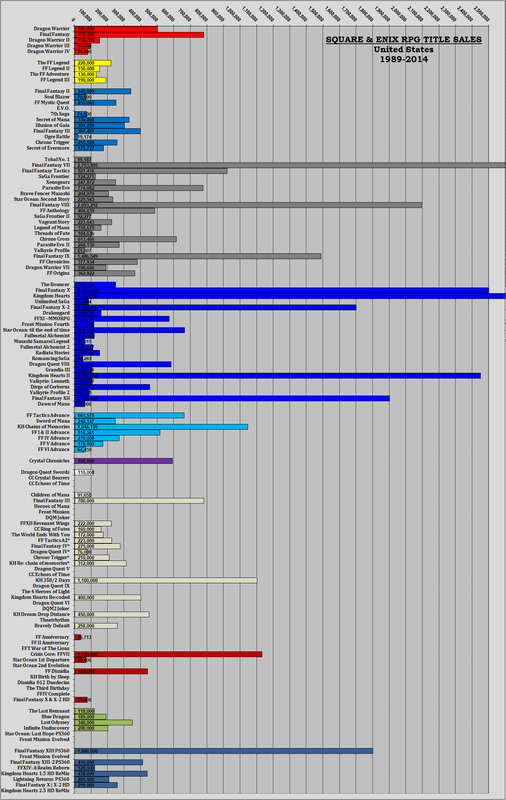 that cited numbers for every system, not all of which are at all accurate -- its Turbografx number is also way off, for example, though this thread has some bad Turbografx numbers in it too as I pointed out on page 2 (last part of the post; never got a response to that). There are a bunch of reasons to believe that the person writing that article with the Nomad number in it didn't know what the actual sales numbers were for too many systems on that list and probably just made stuff up. If there was another source for Nomad sales being at 1 million maybe I'd believe it, but with THAT article being the only one, I won't. In comparison, none of the "1 to 2 million Majesco systems sold" sources are definitely wrong as far as the numbers go, not like the Nomad source is. I believe the Majesco numbers I mentioned in the last post, 1 to 2 million is quite reasonable and fits well with how popular the Genesis 3 was, but do not believe that the Nomad sold anywhere near a million systems. Of course it is possible that the Nomad sold a million, I'm sure it sold decently well in '95, but I'd want better proof than an article that I question. Well yeah, there is basically nothing for 32X. What article states Genesis 3 beat Majesco expectation? Well, we have a "665,000" number which I think is sourced, but that's probably just for holiday season '94 or something like that, with no guesses for sales after that... so most people seem to just assume that that was the final sales number. It actually could be that, but there's no proof. 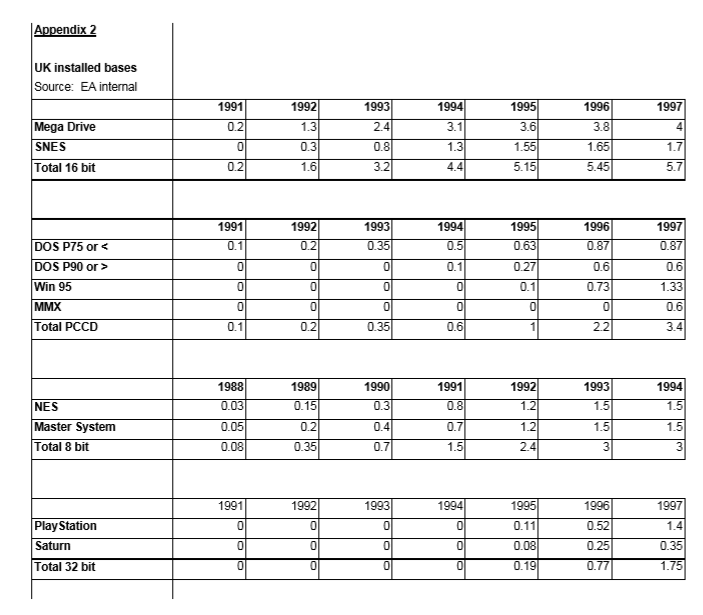 Numbers for the 3DO by SD 1995 report, note that numbers are probably outdated, but it's a starting point. The good news is I've found the writer of that very old post, the bad news is that he doesn't own the mag. Oh, good investigation! That really was an old post Anyway, I'll attempt to get it myself if it comes up for auction unless anyone else here has it. So I'd appreciate it if no-one else bids on it for the purposes of this thread, but if someone does notice it for sale do PM me. I've received a copy of CTW (predecessor to MCV) today after it being lost in the post for six months. These literally never come up (the only issue for sale I've ever come about), so that was a nice surprise. Will post Segadomination UK chart along with some other sales age articles tomorrow. I've been meaning to make a Commodore post. Maybe you've seen this page before. 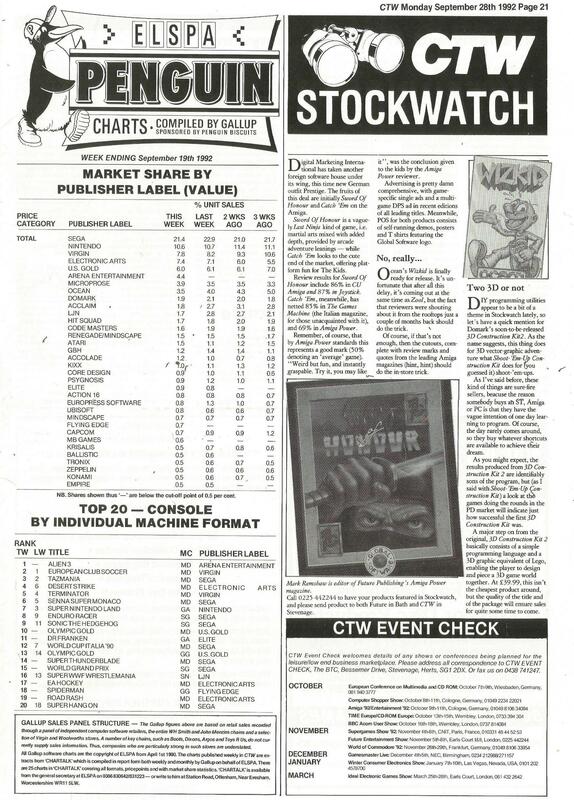 I have some contemporary Commodore UK results which don't match the later "Amiga Format Annual 1993" figures. Here's an interesting article which attempts to calculate the total number of C64s from serial numbers by using the "German Tank Problem" formula. I've worked out the Sega serial number format (turns out I'm not the first), so a similar thing could be done for Sega models. Same thing can be done for other manufacturers if the serial number format can be worked out. That's an interesting approach, but you need a lot of serial numbers for something like this. 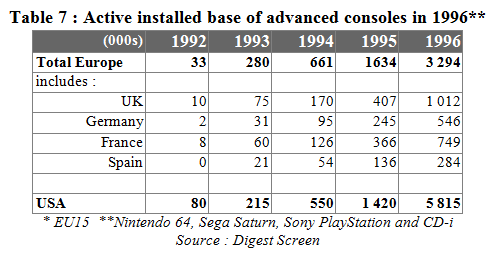 While these numbers combine N64, SS, PS1 and CD-i, we know that the CD-i already launched in 1992 (in EU) and 1991 (in the US), the other systems launched in 1995, so 1991-1994 are just CD-i numbers. So it almost hit the million in 1994, the total LTD is 995.000 units. 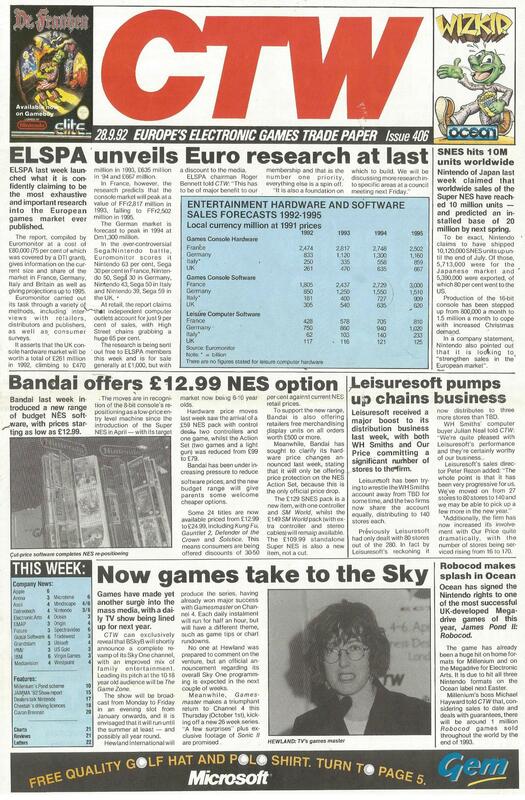 We also know that SS+PS1 sold 170.000 units in the UK in 1995 thanks to ELSPA. Therefore, CD-i active installed base should've been 470.000-170.000 = 237.000 units, which leads to sales of 67.000 units in 1995. Same for the year 1996, N64+SS+PS1 installed base was 940.000 units. 1.012.000-940.000 = 72.000 units active installed base for the CD-i. But this last calculation is probably (wildly) inaccurate because ELSPA data is newer than 1997 SD data. The installed base of the CD-i also shrunk in 1997, but Screen Digest used to do this with their "active installed base"-numbers if a system fades away from the market. Any reason why you haven't updated the 3DO international sales? You can imagine his surprise ah ah ah. I need to do an image backup of all the images in this thread to my website or something, just so nothing is lost due to an imagehost going down or something. I know I keep saying it, but, there are so many great things in this thread. Could someone translate this article (the data and what it refer to)? Appears to be shipments (in ten thousands) through March 1995.